RAW did it’s best average rating in over 2 months for last night’s show built around the crowning of a new universal champion. The show did 3.413 million viewers, it’s best number since June 20th. The show had a very unusual ratings pattern as the first hour, at 3.392 million viewers, was the lowest of the three. It rose slightly in hour 2 to 3.438 million and had a very small drop for hour 3 to 3.409 million, remaining remarkably consistent for the 3 hour broadcast. The show was 3rd for the night on cable in terms of total viewers behind Rizzoli and Isles and Major Crimes and the three hours were #4, 2 and 1 respectively in the 18-49 demo, topping out at 1.21 for the third hour. Kevin Owens wins the WWE Universal Championship - Triple H helps K.O. become the second ever WWE Universal champion. Find out all the details of this historic victory. 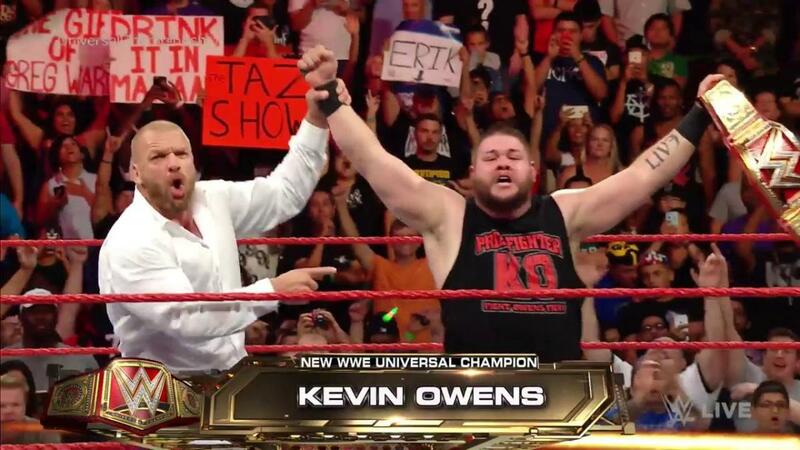 Plus, check out the WWE Raw video highlights: The coronation of Kevin Owens. Despite action, Saturday's UFC on Fox 21 draws record low viewership - Are you telling me that Demian Maia is even less of a draw than Demetrius Johnson? Ace Fontaine will explain why in this piece. WOR: New WWE Universal Champion, Raw report, death of Mr. Fuji, more! 8/30 - On the latest Wrestling Observer Radio show, Dave and Bryan breakdown RAW and have a lenghty discussion about the life of Mr. Fuji. Daniel Bryan to respond to The Miz's Talking Smack comments - After Daniel Bryan walked off the set of Talking Smack last week during the Miz's lunacy, he had a week to think it over. We now hear his side of the story. WWE Raw live results: A new Universal Champion is crowned - Kevin Owens had some help to defeat three men in one match. Find out how KO defeated Big Cass, Roman Reigns, and Seth Rollins. Cody Rhodes battles Sami Callihan in BOLA preview for Northeast Wrestling - Cody Rhodes continues on his dream tour, this time challenging independent sensation Sami Callihan. WWE San Antonio, TX, live results: Dean Ambrose vs. Bray Wyatt vs. AJ Styles - Find out how who's getting the rub, and who's getting buried. Figure Four Weekly: Figure Four Weekly 8/29/2016: NWA vs. Department of Justice - Recently, as an outgrowth of my interest in public records, court records, and so on, I started to get into the habit of filing Freedom of Information Act (or "FOIA") requests with various United States government agencies. It was the same fascination that took me to the court records; There's stuff out there, just waiting to be seen, that nobody was looking at... Subscribers click here to continue reading. Wrestling Observer Newsletter: August 29, 2016 Wrestling Observer Newsletter: UFC sale final, Summerslam results and fallout, more - Lorenzo Fertitta, the CEO and person who historically should be remembered as perhaps the most important figure in making MMA into a worldwide sport left the office for the final time on 8/17. The UFC staff was all told to come for a meeting, and as it turned out, the guest of honor was busy at first and they had to regroup and come back later. Fertitta, 48, took a $2 million investment in 2001 to a $4 billion sale 15 years later. Aside from making a killing in business, he saved a sport that was on its deathbed in the U.S. The sale was officially completed with the money changing hands this past week, a similar letter to the one above was sent to all company employees, and the new era of UFC began with UFC 202... Subscribers click here to continue reading. WON BACK ISSUE: August 2, 1999 Wrestling Observer Newsletter: Vince McMahon comments on Bret Hart, WWF Fully Loaded review, more - While nobody in their right mind believed that they'd heard the last of Vince McMahon vs. Bret Hart, McMahon went out of his way to goad Hart into responding with blistering comments on TSN's "Off the Record" talk show, which was taped on 7/22 and aired on 7/27... Subscribers click here to continue reading. On Monday’s edition of Wrestling Observer Radio, Dave Meltzer said Alberto Del Rio has been pulled from all WWE shows going forward, even after his 30-day suspension is over. ​Smackdown tonight is from Dallas. John Cena, Roman Reigns and Seth Rollins are all advertised, but Reigns and Rollins are likely to be in dark matches and Cena may be as well. Bellator 160 Friday night on Spike TV did 725,000 viewers for the show headlined by Benson Henderson vs Patricio Pitbull. It was the promotion’s best rating since March 4th. Following his best-of-seven series match with Sheamus on last night’s Raw, WWE issued a storyline injury update on Cesaro. The update claimed Cesaro had suffered “multiple contusions to the lumbar spine” during the match. The final round of additions to the WWE 2K17 roster were announced on Tuesday morning, with Asuka, Bayley, Big Boss Man, Buddy Murphy, Cactus Jack, Dean Ambrose, Diesel, Dude Love, Dusty Rhodes, Goldust, Jack Swagger, John Cena, Kane, Kevin Owens, Lex Luger, Luke Harper, Mankind, Road Dogg Jesse James, Roman Reigns, Seth Rollins, Stone Cold Steve Austin, Undertaker, Vader and Wesley Blake confirmed as appearing in the game. The full roster for WWE 2K17 is available to view here. WWE confirmed that The Headbangers will be making an appearance on tonight’s episode of SmackDown. The Reno Gazette-Journal has a feature plugging an upcoming house show. In a transcript provided by Chris Charlton, Hiroshi Tanahashi speculates on why he isn’t as popular in the United States as he is in Japan. Bobby Roode is home tonight in Peterborough and will be dropping the ceremonial first ball at the Major Series Lacrosse Championship Game #5 featuring the Peterborough Lakers vs the Six Nations Chiefs. 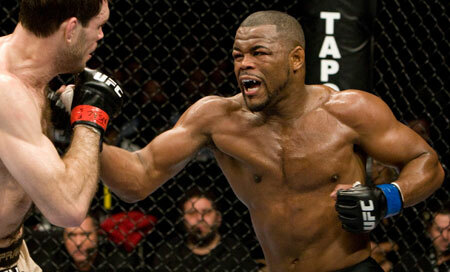 "Suga" Rashad Evans will be dropping down to the middleweight division for his next fight, which would be smart since he was most recently dismantled quickly by Glover Teixeira, who was quickly dismantled by Rumble Johnson. Two fights were added today for the UFC card in Manila on Oct 15. Mizuto Hirota (17-7- 2), the “Road to Japan” co-winner will take on Cole Miller (21-10) in a featherweight bout. Seo Hee Ham (17-7) takes on Danielle Taylor (7-2) in a strawweight fight. The Alex Enlund-Martin Buschkamp fight scheduled for this Saturday in Hamburg has been cancelled due to an injury on the part of Enlund. Due to the late timing, the fight will not be replaced on the card. Muay Thai champion Tiffany Van Zoest will make her professional MMA debut for Invicta FC on September 23 rd in Kansas City. She’ll face Kalyn Schwartz. PWEclipse has put up their entire Summer Twilight 2015 show here featuring an awesome Tarik vs Roderick Strong match. This article examines what comedy can learn from wrestling. CTW Charity Wrestling raised about $2,000 for the Cystic Fibrosis Foundation. John Corrigan has a full report. Here’s a new video from the WWE2k event last week. The video has most of the guys talking about their favorite metal bands with some fun anecdotes from Kevin Owens and Big Cass about travel buddies, Miz getting mocked for bringing a guitar on the road and Brock Lesnar picking Rob Zombie of all people as his tag team partner. Alison Brie will star in Netflix’s upcoming wrestling comedy series based on the 1980s Gorgeous Ladies of Wrestling promotion. In this clip former "Quebecer" Pierre Carl Ouellet talks about working with new WWE Universal Champion Kevin Owens/Steen since he was 14 training at Jacques Rougeau's Montreal Wrestling school, the problems Owen's had with Jacques that led to them parting on bad terms as well Pierre's matche and personal relationship with Owens.